Even if you can’t read the title of this opened book, it’s easy to see that this scene was set for the nanny who is practically perfect in every way, Mary Poppins. Located in the room furthest back in the United Kingdom pavilion of World Showcase, also known as The Toy Soldier shop, this set up is designed as a meet and greet area. Obviously, Mary Poppins can usually be seen in her Jolly Holiday scene dress behind the cottage shop called The Tea Caddy, but it is nice to see that there is somewhere else for her to call home. Since Mary Poppins started out as a book in 1934, it is only fitting that the opening scene of the film, which features Katie Nana, is written out here in this location. The other pieces, the lamp and carpetbag, are the belongings of Mary Poppins. 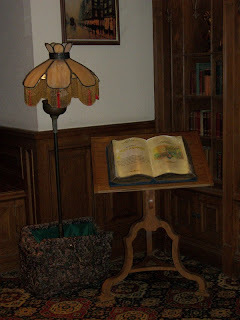 The seemingly bottomless carpetbag is highlighted during the film when Mary sets up her room, with song of course, under the watchful eyes of Jane and Michael.